Monarch Air Group provides private air charter in Evansville, IN. Our clients benefit from top-notch service, unrelenting dedication to safety, wide selection of aircraft, and years of experience in chartering private jets. To obtain a free quote, please use our online quoting tool provided below, or call toll free 1-877-281-3051. Monarch Air Group provides private jet charter flights in and out of Evansville, Indiana, USA. 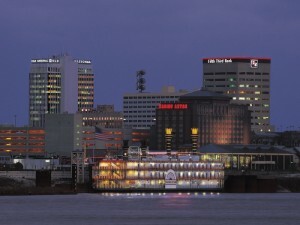 Often called “River City”, Evansville is the third-largest city in southwestern Indiana, on the Ohio River. It is also the commercial, cultural and medical hub of its state. The city’s economy is known for its diversity, stability, and vitality. There are many things to see and to do. The most popular tourist attractions include Casino Aztar, Victory Theatre, University of Evansville, Reitz Home Museum, Angel Mounds State Historic Site, Evansville Museum of Arts, History and Science, Children’s Museum of Evansville, Mesker Park Zoo, Burdette Park, and much more. The city is served by Evansville Regional Airport (EVV / KEVV), which is located 5 miles from the center of Evansville, and Owensboro-Daviess County Regional Airport (OWB / KOWB), which is situated 39 miles from Evansville. 1. EVV, Evansville Regional Airport, Evansville, IN, United States. 2. FRH, Municipal, French Lick, United States. 3. HNB, Municipal, Huntingburg, United States. 4. HSB, Raleigh, Harrisburg, United States. 6. OEA, Oneal, Vincennes, United States. 7. OLY, Olney-Noble, Olney, United States. 8. OTN, Green, Oaktown, United States. 9. OWB, Daviess County, Owensboro, United States. 1. Clarion Inn, 4101 Hwy 41 N, Evansville. 2. Executive Inn Heliport, . 3. Clarion Inn, 4101 Hwy 41 N, Evansville. 4. Executive Inn Heliport, . 5. Clarion Inn, 4101 Hwy 41 N, Evansville.